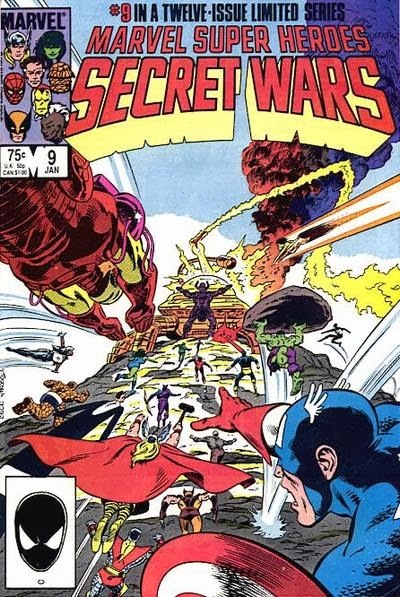 Secret Wars by Jim Shooter, Mike Zeck, and Bob Layton was the first big event in Marvel Comics, pitting a bunch of their superheroes against a bunch of their supervillains due to a plot by the otherworldly Beyonder. Crisis on Infinite Earths by Marv Wolfman and George Perez came out soon after (their first issues were 11 months apart, so Secret Wars was ending just as Crisis was starting). I thought it would be fun to look at the covers for both and compare them based on two questions. 1.) 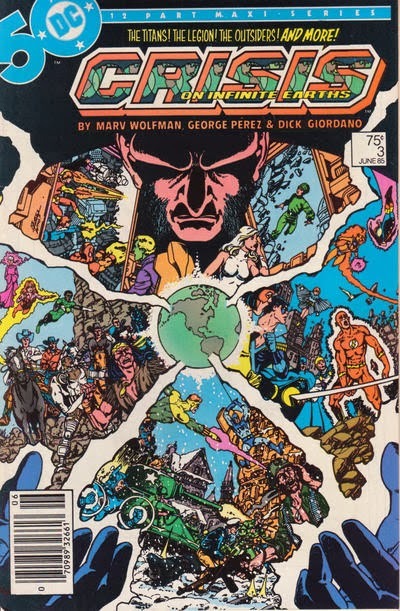 Provided that I saw them in the shop at the exact same time when I was a kid (I was two and a half when Crisis started, so let's just pretend I saw them issue by issue when I was six for the sake of argument), with no context other than what I know of the characters through the general consciousness at the time, and I had never bought a comic before, which one of the two would I buy? 2.) From my current standpoint, which cover do I think is better drawn? Which would I have bought as a kid? 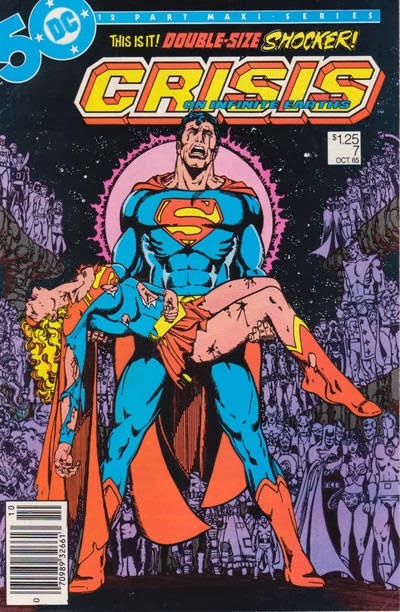 I have always been a fan of parallel universes, and because of the multiple earths and seeing old Superman, it's possible that young me would have gone with Crisis. 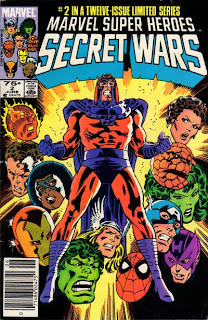 But I'm reasonably sure I'd have picked Secret Wars, because the first comic I ever remember begging my mom to buy because I absolutely, definitely must have it was Infinity Gauntlet #3, with this cover. 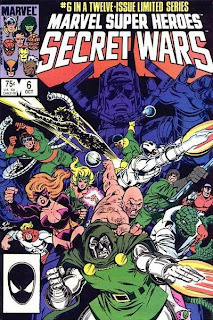 Secret Wars wins this one for me based on the fact that it's a bunch of heroes charging towards us (one of my favorite cover concepts ever) and that those heroes are instantly recognizable. 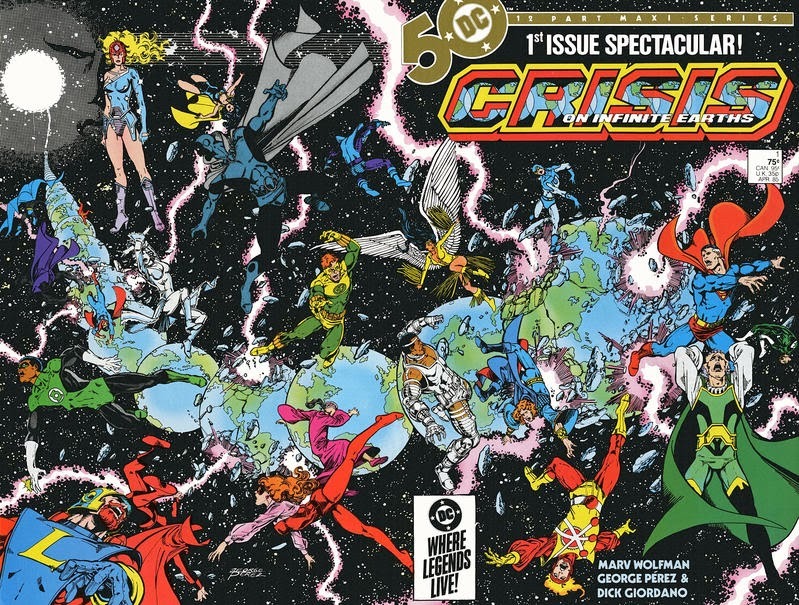 Crisis is old Superman with a bunch of people I wouldn't have recognized (wait, that's not true; I had a Firestorm action figure. Still.). Which is better drawn? I'm clearly biased in that I prefer Perez's draftsmanship over that of anyone else's, but even with that, I think Secret Wars is the better cover. The concept is stronger, it's more eye-catching, and maybe it's just me, but the colors really seem to be arranged in such a way that they pop out. 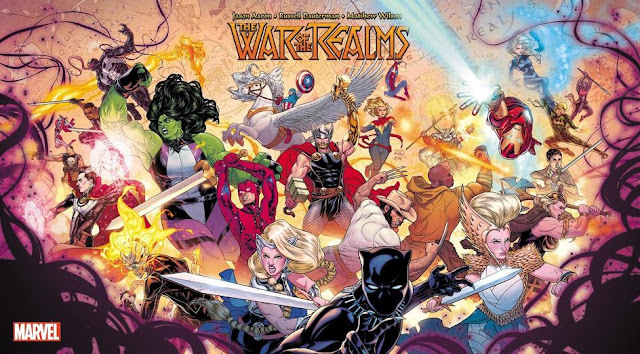 Crisis is chaotic, and it's supposed to be, but in comparison to Secret Wars and especially as a first issue, I just don't think it's as compelling. Which is better drawn? I definitely think Secret Wars is the more dynamic, eye-catching cover between these two, and that Crisis suffers from the central image being a giant shadow. Which would I have bought as a kid? 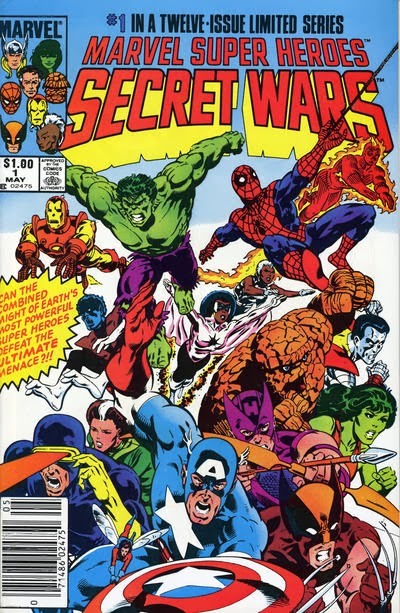 Okay, there's no way young me wouldn't have bought Secret Wars here, Crisis comparison or not. 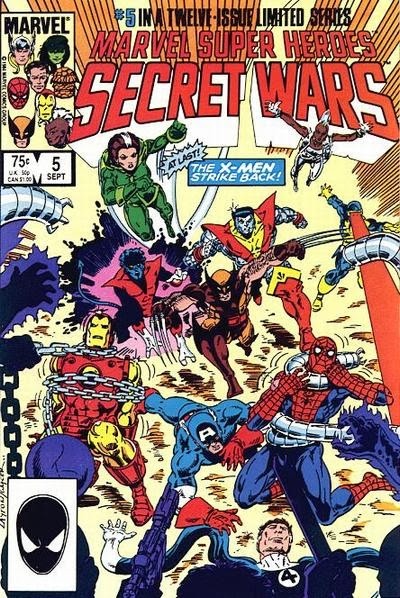 Spider-Man fighting the X-Men singlehandedly is a comic I would have had to have. Which is better drawn? 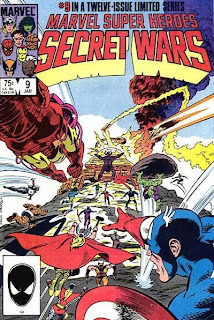 This is more apples and oranges than the previous ones because we've got just one event happening on the Secret Wars cover and multiple events being shown on the Crisis cover. 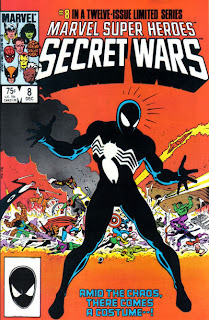 I think I'm gonna give this one to Secret Wars again just for being more striking. 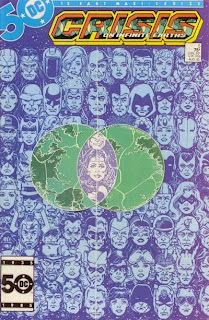 This isn't even about the content so much as the fact that I would see what was going on in that cover across the shop, and there's no way the Crisis cover would catch my eye unless I was close to it. Which would I have bought as a kid? 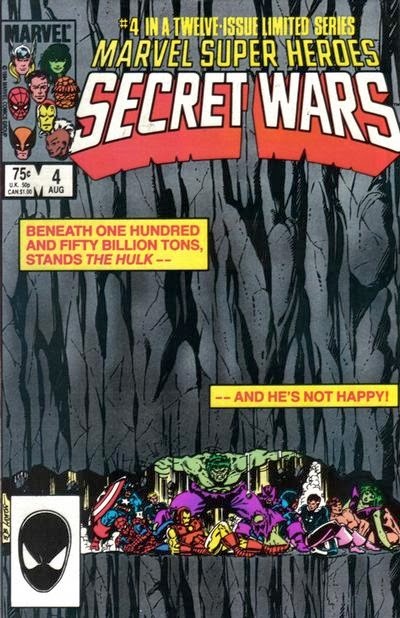 The Hulk is holding up a mountain. The other one has three dudes I would have not heard of at that point. 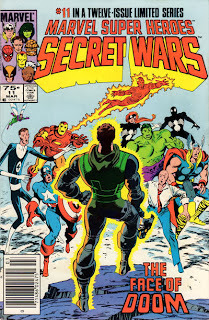 Secret Wars. Which would I have bought as a kid? 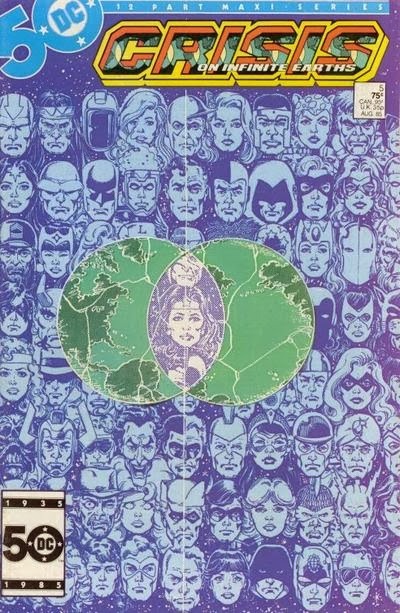 Like I said, I love parallel universes and young me would have thought "The more, the merrier." Crisis wins this for me,hands down. Which is better drawn? Crisis is simple, but incredibly effective. It wins this one for me. Which would I have bought as a kid? 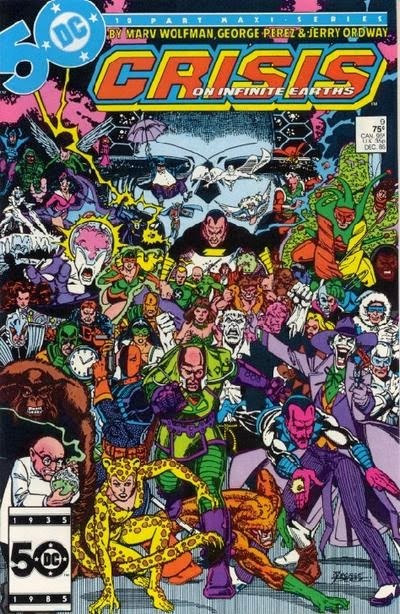 This is really tough, because on the one hand I'd have been really intrigued by those villains, even if, as a kid, I'd have known only two of them. 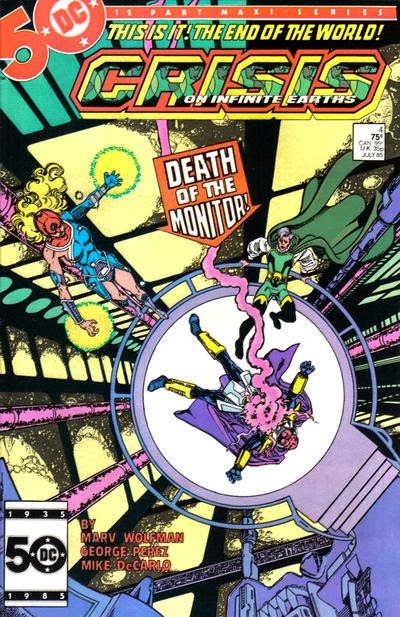 On the other hand, I think that picture of the Anti-Monitor is really well drawn. This would have been a case where I would have wanted to know who the hell he was. I think I'm going with Crisis here. Which is better drawn? There really is no way the Crisis cover doesn't attract my attention and make me want to buy it, just based purely on how it's drawn. Which is better drawn? They're actually relatively similar covers, aren't they? 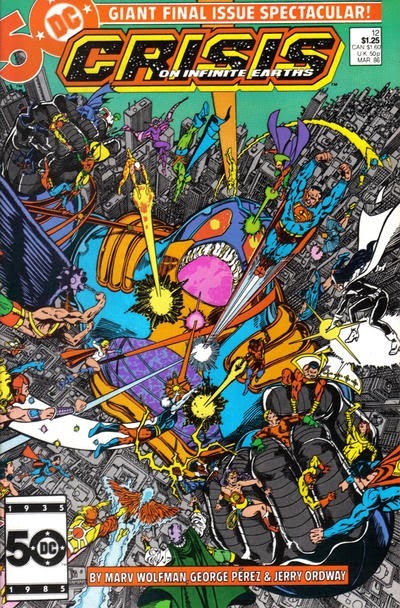 You've got the big foreground guys in big bright colors surrounded by a bunch of other dudes without those big bright colors. 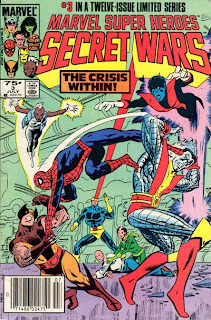 But Crisis is one of the greatest covers of all time, and I tend to forget this Secret Wars cover exists. Crisis. Which would I have bought as a kid? 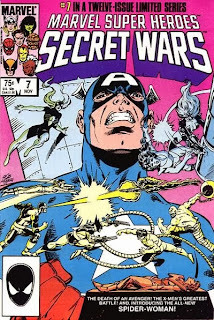 Mike Zeck makes his return to Secret Wars cover duty with a truly striking cover featuring the debut of one of the greatest costume redesigns ever. Unfortunately, he's up against one of the greatest things George Perez has ever drawn, and "Amid the chaos, there comes a costume--!" 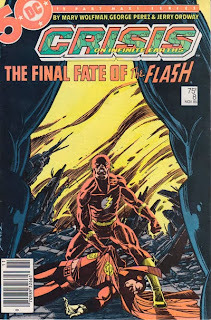 just doesn't hold a candle to "The Final Fate of the Flash!" Crisis wins this for me, especially since I think I was a bigger Flash fan as a kid than a Spider-Man fan. Which is better drawn? They're both striking, but one conveys surprise and shock while the other one conveys tension and drama. A close call, but Crisis wins. Which would I have bought as a kid? 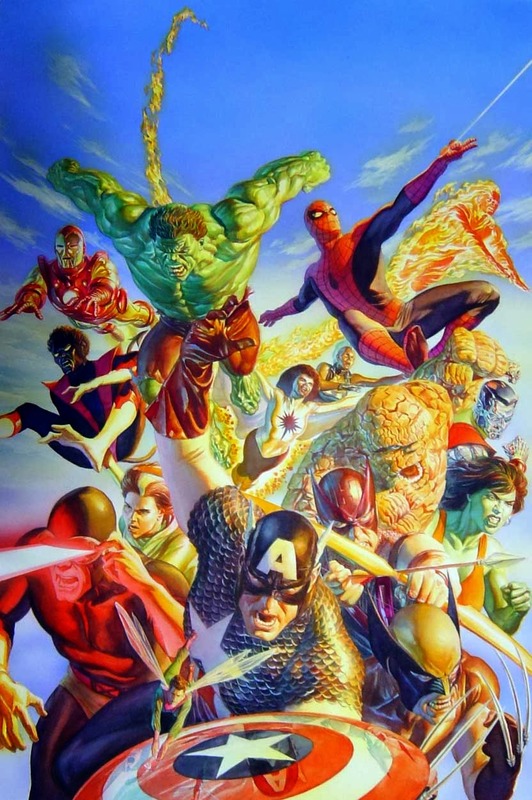 Heroes charging toward something or villains charging toward us? A tough call, since the latter has a bigger crowd, but as a young new reader, I'd have leaned towards the one with the heroes. Which is better drawn? If only Galactus weren't colored in such a way that he's basically an afterthought, Secret Wars might be putting up more of a fight. Crisis is a prototypical Perez group shot with each villain showing off his or her own distinct personality, and they're coming right at the reader. Crisis wins, marking the first time I gave different answers. Which would I have bought as a kid? I'm not sure if I'd have known Doom as a kid, but I was never a big fan of the character. 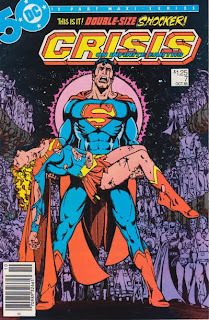 On the other hand, Crisis has two Supermen on the cover. And Captain Marvel. Crisis! Which is better drawn? Secret Wars wins this one for me. 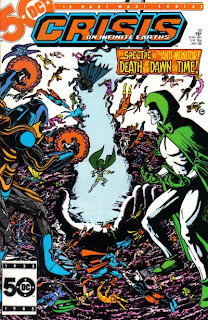 It's a striking image, with Doom filling up the entire page on one knee, that is almost Kirby-esque. 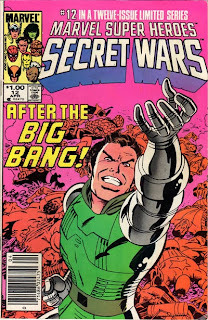 Crisis is a good cover too, but Secret Wars is just better. Which would I have bought as a kid? 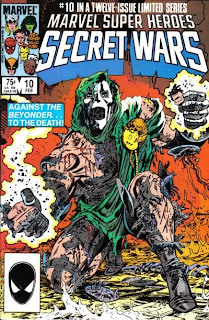 Again, I'm not sure I'd have known who Doom was as a kid. Maybe I would have thought "Doom" was metaphorical in that copy. 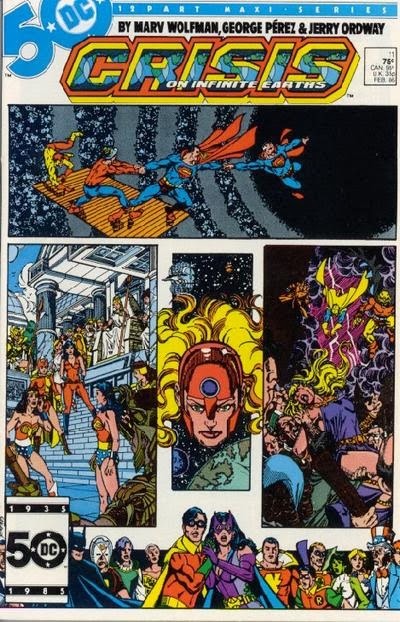 Bu it wouldn't be enough — Crisis has two Supermen, two Wonder Women, and an adult Robin, and doppelganger-loving me would have eaten it up. Which is better drawn? Wow, it feels like they kind of stopped trying. 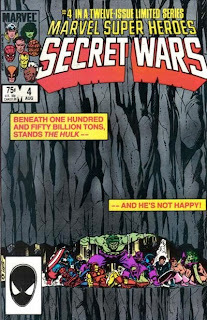 Uh, I'm gonna give it to Secret Wars just for settling on one image, 'cause why not. Which would I have bought as a kid? See, even if I did know who Doom was, would I have thought that was Doom over there? I'm not sure. Is the rest of his costume sans mask really so recognizable? 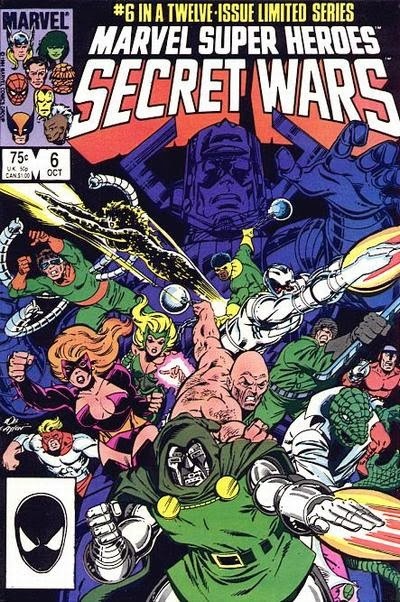 I think I would have a higher chance of picking Secret Wars if the coloring had been better, like if, I dunno, they didn't just decide to color all the heroes red and we actually saw Doom standing over their fallen bodies more clearly, but it still probably wouldn't have beaten out the two Supermen. Which is better drawn? 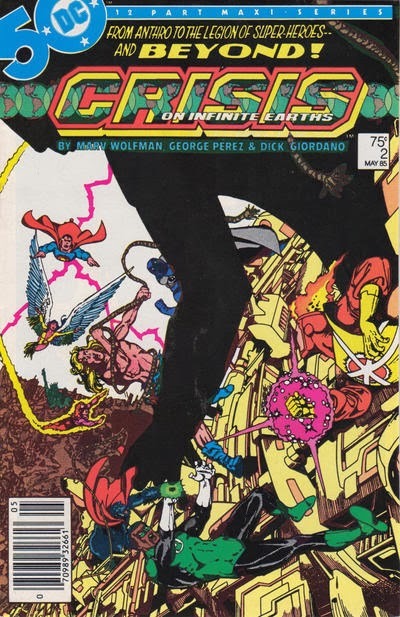 I'm going to have to go with Crisis here, because something about Doom's foreshortening bugs me. 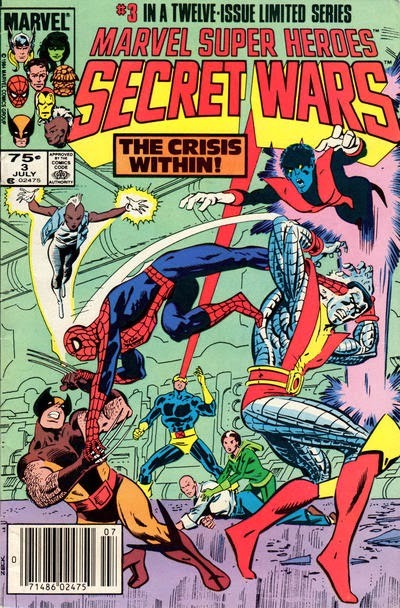 Well, it looks like young Cube would have bought seven Crisis issues over the corresponding issues of Secret Wars, so that makes the score for the first question 7-5 in favor of Crisis. Probably not a surprise since I was a sucker for doppelgangers and parallel earths and doubles as a kid, but given just a bit more knowledge (and maybe an affection for Doom), it probably could have swung either way. On a technical level, it looks like it's even, 6-6. So what did we learn? That I was a big fan of multiverses and doubles and that I don't really like Doom. So, really, we learned nothing! But I hope you had fun reading! 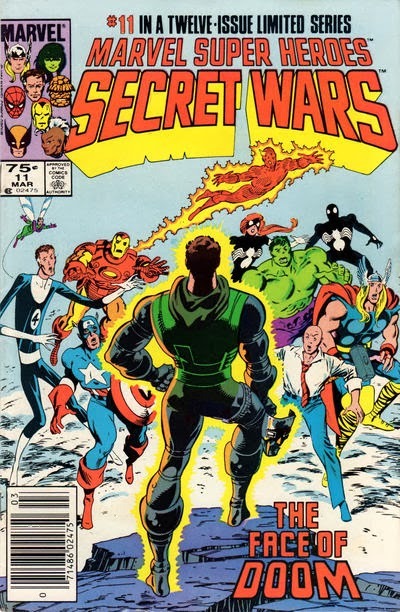 Not only did I actually buy all of these comics when they came out, but I actually did the cover comparison on my living room floor back then. 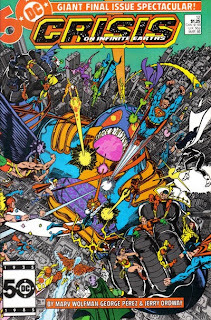 Yeah, it's basically a tie especially with issues 6 and 8 being equal, but technically George Perez's draftsmanship was superior and more detailed. 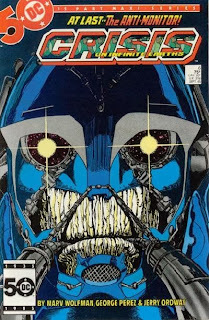 Issue 7 of course is one of the greatest covers of all time. 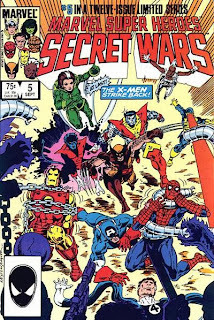 Secret Wars should have nothing on Crisis from the story, art, and historical importance- in fact this was shown in an underground comic called Secret Doors at the time- yet there's something magical about Secret Wars even though it should have been compared to Super Powers.